Looks like summer is really here with temperatures around 90* and rising. Just thinking about a day at the shore brings a smile to my face. Even though I don’t like to actually swim in the ocean, I do love hearing the waves, wading in the surf and sitting under a palm tree in the shade. Follow along to create this fun card! 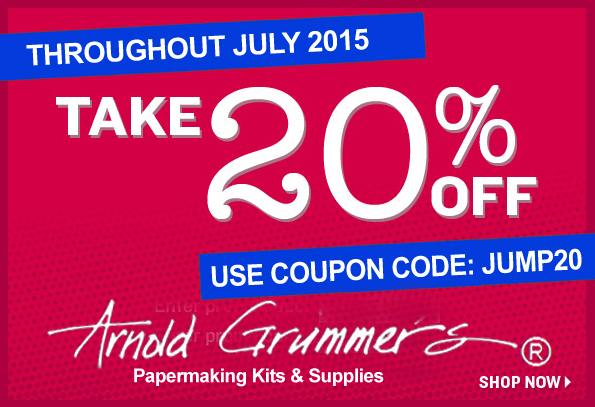 Follow the instructions found in any of the Arnold Grummer™ paper making kits to create a sheet each of heavy weight light blue & tan paper. Dry the sheets of paper. 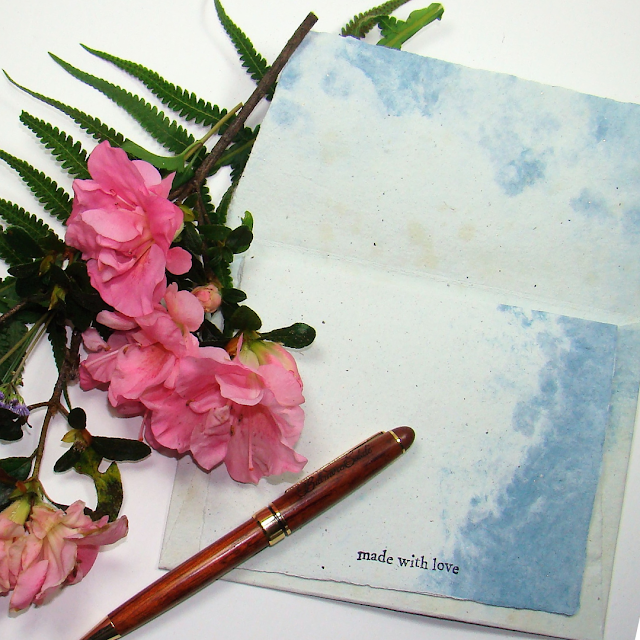 When the sheets of handmade paper are dry, cut or tear the blue sheets in half creating two 5 ½ x 8 ½’ cards. Score and fold the cards. Tear or cut the tan sheet in half. Tear an approx. 11/2” piece for the sand. Die cut 1 tiny seagull & 2 chairs for each card from the white card stock. Die cut the palm trees for each card from a scrap of the tan handmade paper. Shade the palm tree trunks and the bottom part of the sand dunes with the golden tan ink and Stylust™ tips or make-up sponge. Dampen the tip or sponge with a tiny bit of water to be able to blend the colors. Clean the tip or sponge between colors. Dry the tip or sponge on a towel. Shade the palm tree fronds with the green ink. Clean & dry the tip or sponge. Add some blue ink to the sky forming clouds. Blend with a damp tip or sponge. Use the plastic’s straight edge, the tip or sponge and the blue ink to create the water line. Blend with a damp tip or sponge. Attach the tiny seagull to the sky & the sand dunes to the bottom of the card with ZipDry™ adhesive. Attach the straps to the tiny sandals with ZipDry™ adhesive. 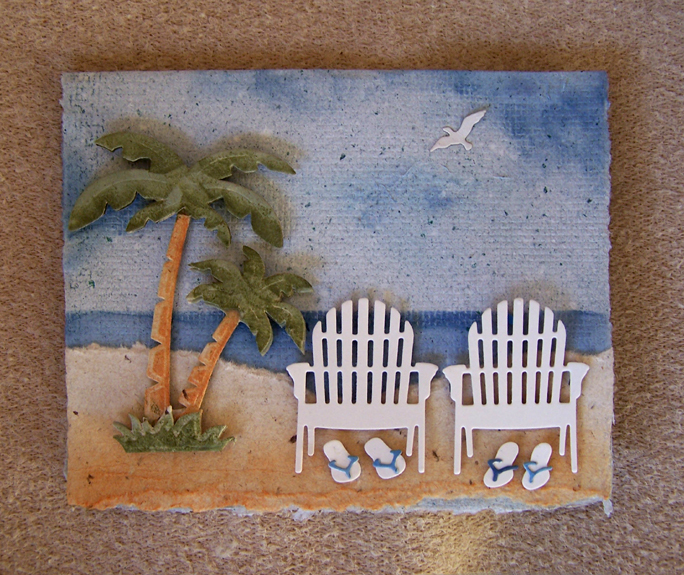 Attach the palm trees, flip flop sandals and chairs to the card front with tiny pieces of foam tape or dots. LOVE the little beach scene card!! 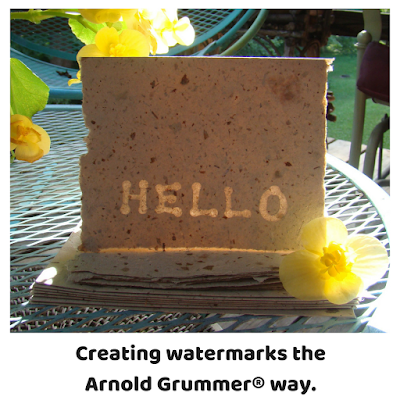 Handmade paper makes the perfect texture for sand and water! How cool is this! Lovely. Michelle! Your projects are timeless. This summer card draws me into a tough choice ... a day at the beach or a day at the blender? !